“[Hitler in Los Angeles] is part thriller and all chiller, about how close the California Reich came to succeeding” (Los Angeles Times). U.S. law enforcement agencies were not paying close attention--preferring to monitor Reds rather than Nazis--and only attorney Leon Lewis and his daring ring of spies stood in the way. From 1933 until the end of World War II, Lewis, the man Nazis would come to call “the most dangerous Jew in Los Angeles,” ran a spy operation comprised of military veterans and their wives who infiltrated every Nazi and fascist group in Los Angeles. Often rising to leadership positions, they uncovered and foiled the Nazi's disturbing plans for death and destruction. 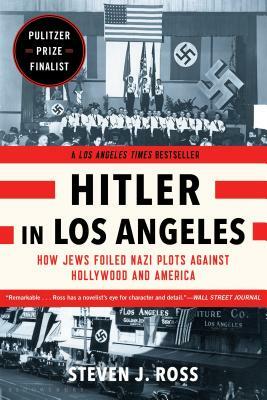 Featuring a large cast of Nazis, undercover agents, and colorful supporting players, the Los Angeles Times­ bestselling Hitler in Los Angeles, by acclaimed historian Steven J. Ross, tells the story of Lewis's daring spy network in a time when hate groups had moved from the margins to the mainstream. Steven J. Ross is professor of history at the University of Southern California and director of the Casden Institute for the Study of the Jewish Role in American Life. He is the author of Hollywood Left and Right, recipient of the Academy of Motion Picture Arts and Sciences' Film Scholars Award and nominated for a Pulitzer; Working-Class Hollywood, nominated for a Pulitzer and the National Book Award; Movies and American Society; and Workers on the Edge. He lives in Southern California.